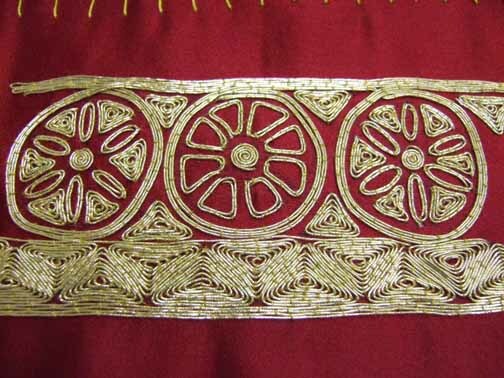 On one of my recent travels round the internet I was following a link from Constance’s lovely ‘Born in the Wrong Age’ blog (do go and visit she is an re-enactor in Australia who does fab needlework) and found this wonderful site full of members’ needlework projects from the West Kingdom of the Society of Creative Anachronism. 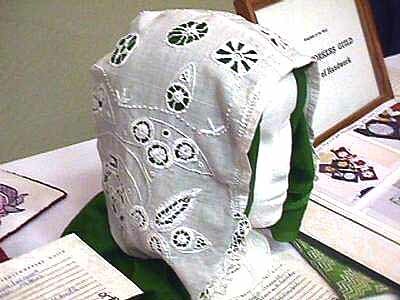 The society operates worldwide though they seem to be most active in the US and their members produce the most wonderful examples of historical needlework. To whet your appetite I hope they don’t mine but I have borrowed a few pics to show you the standard of work which is amazing. There are loads more on the site as well as lots of really good info and articles (click on the Articles link on the right hand menu on their site ) so do go and have a look. All very,very talented ladies I’m sure you will agree. I am having a quiet week at home doing lots of marking and listening to the rain! 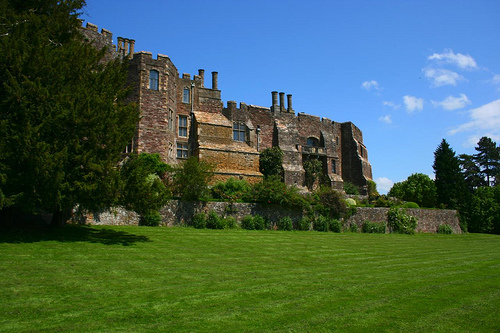 We are off this weekend to the wonderful Berkeley Castle where we have this as our view. Not a bad view for a campsite! 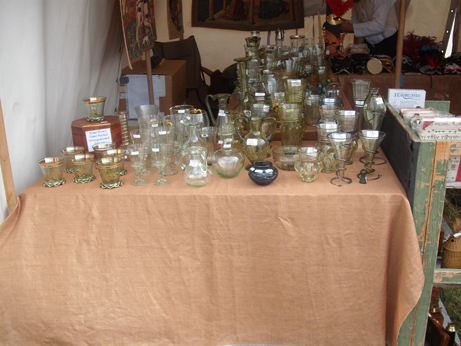 Even if you are not coming pray for fine weather for us please – last year this was our wettest pitch and even though we don’t mind a bit of damp as we are hardy campers it puts off the paying public and that is a real shame for us and all the people who give up all their time and effort to organise these events. As I have mentioned before most of the events rely on unpaid volunteers for the organising and the hard work of providing facilities and without paying visitors they will not happen (someone has to pay for the portaloos!) . So here’s hoping for very good weather this year! After that event we are off for a week camping in the Forest of Dean with my sister Jacky (did I mention that I love camping!) and then it is straight on to Ashby de La Zouche castle in Leicestershire for another weekend of camping (I love, love, love camping!!!) where our group are doing another show. 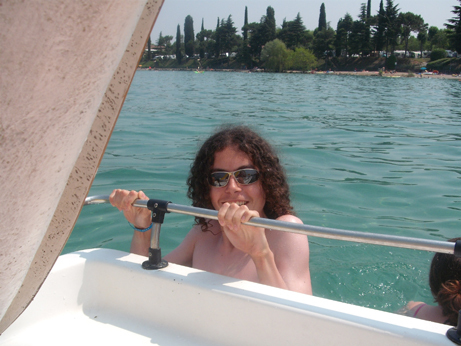 So the blog will be very quiet for a bit while I paddle in mud (no hopefully bask in the sun!) in a field somewhere and enjoy some lovely campfires and BBQs ( I also love BBQs!). Thanks very much for visiting – see you all soon! 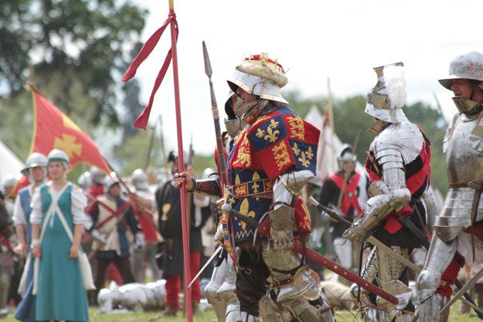 We had a fantastic weekend – one of the very best Tewkesbury events ever – very well organised (thanks to all the hard work of the crew), lovely weather – was very hot Sat morning for our trip round the market but did cool down for both battles. However our water giving services were much appreciated.Great fun both round the camp fire and in the beer tent – altogether fab! 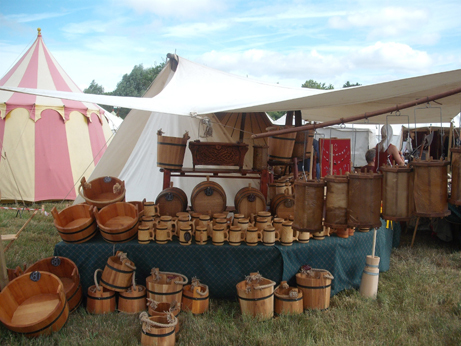 As promised here are some pics from the market – we have medieval markets at most events but as Tewkesbury is the biggest event it also has the biggest and best market where you can purchase anything you want for your medieval lifestyle. There are lots of clothes sellers, fabric sellers (I was very good and didn’t get tempted! 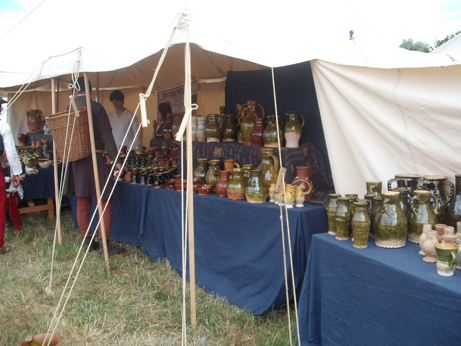 ), armour, weapons etc but also some amazing craftspeople selling their wares. 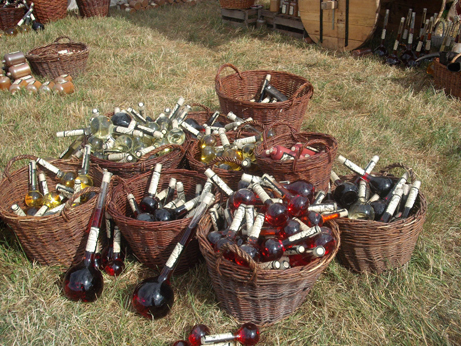 Mugs and jugs a plenty..
And of course lovely food and drink – this German wine and spirit seller was new this year – I passed on the 80% proof chilli vodka but did try the bilberry wine in the long-necked bottles here – very nice! Normally I don’t get many pics of me on the battlefield but was looking on Facebook when I got back and was very excited to find a few of me. 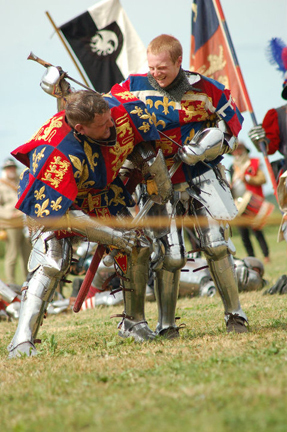 Here I am in the thick of the battle in my usual blue dress.Pictures taken by Helen Harris Beaumont. And was very excited to find the next pic has me and Ellie in the background! 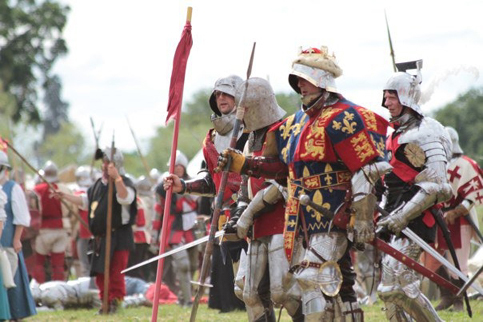 It really is so wonderfully atmospheric with all the different colours of the heraldry and flags flying – especially at the end on Sunday where we all knelt on the battlefield before the King – brings a lump to your throat! …. 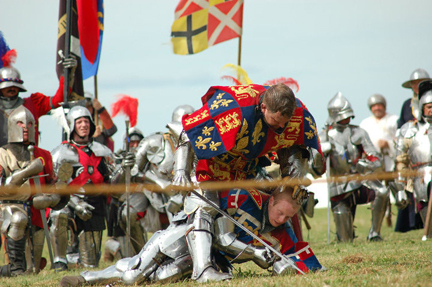 and of course he wins – Hurrah for the House of York! Take that you young upstart! We stayed with my sister for a couple of days after the event and helped Ellen move into her new student house. I bought her some BBQ stuff as a house-warming pressie so she has promised to send me a pic of them in their lovely garden – hoping they are having better weather than we are! Undaunted I have today refilled the freezer with Tesco’s finest BBQ wares so hopefully at some point this weekend – after the hedges have been cut – we will be out again enjoying the sunshine. Hope you are having better weather – thanks for visiting. Lake Garda was as stunning as I hoped it would be – my pics do not do justice to the gorgeous mountains all around – it was very hazy as it was so hot but one night it rained and in the early morning they looked amazing – all rolling back in shades of blue. 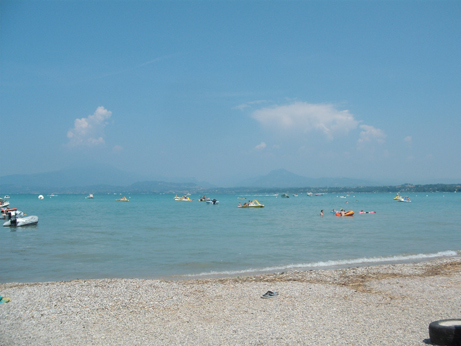 I was looking on Flickr for some good pics of Lake Garda and found an amazing set of pics of Italy – check this link . We spent a lot of time on the lake hiring pedalos and swimming – here are the kids trying to not to show how cold the water was! The camp site also had 5 very nice swimming pools with added aquarobics that Ellie and I enjoyed (Jake tried it once but was not keen!) and they made good use of their water guns. It was too hot to do much sightseeing but one evening we went into the nearby town of Peschiera Del Garda for a wander round and a meal (I tried some of the local Grappa liqueur – very strong, Ellie was not keen!). It is a very pretty little town most of which is built on a walled fort so there are moats everywhere. 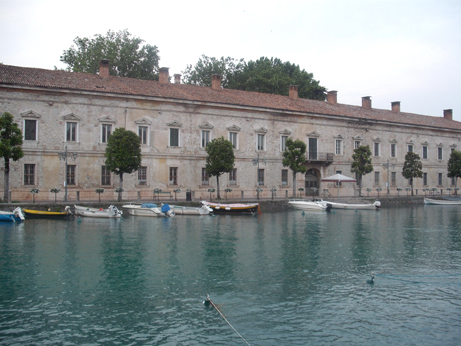 I also went on the ferry up the lake to the town of Sirmione which had a lovely church with frescos on the walls dated 1508 which were stunning and a very lovely and heavily fortified castle in the middle of town. 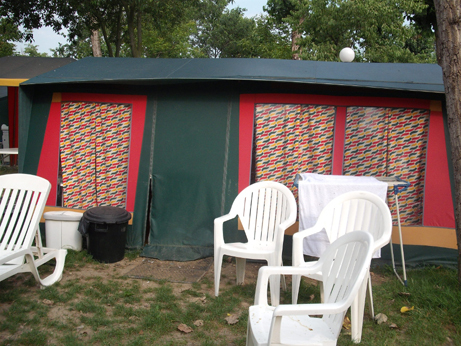 I also did get a bit of knitting done – it was very lovely lounging outside the tent with the lake views and I also took it to the pool once – just to embarrass the kids of course! I have cast on for another baby cardigan in the same pattern that I have just finished (now I know what to do with the border it should be a quicker finish!). 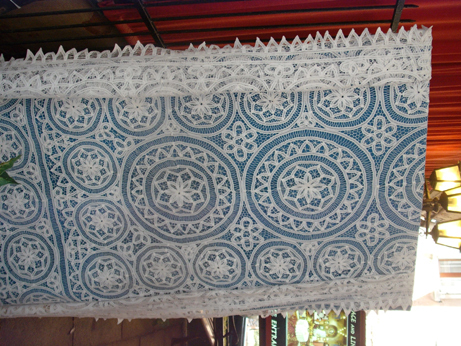 Same wool as well – the Sublime – this time in a beautiful turquoise colour – this will be an Xmas pressie for another family member. 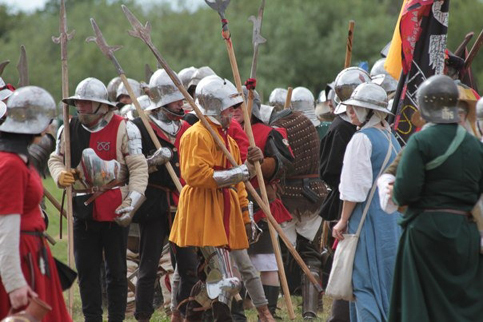 We are off to our biggest event this weekend – the Tewkesbury Medieval Festival – I can’t wait – I love this show best of all – the smell of the gunpowder, the flags and the biggest medieval market. 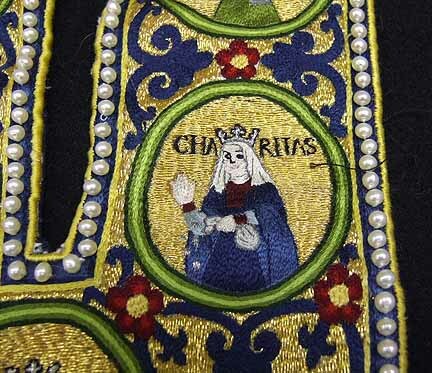 If you are in the area it is well worth a visit (in Gloucestershire just off the M5) . Will take some pics of all the nice things for you. I took so many pics of all the beautiful buildings that I had a hard time choosing which to put up here. 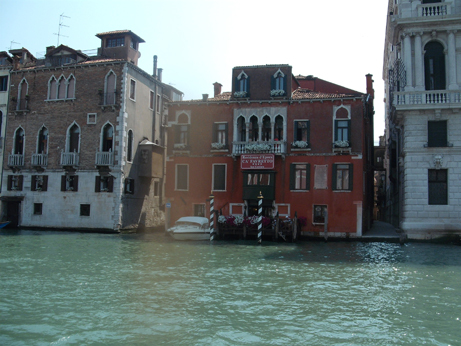 We only had one day in Venice plus our lovely first evening so just had time for a trip up and back on the Grand Canal which was just fab – I have always loved Caneletto’s paintings of Venice and to be there was amazing. We spent the rest of the day in St Mark’s Square visiting the Doge’s Palace ( that has been on my ‘must see’ list for so long) and the Basilica which has to be the most amazing church I have visited (and I have been in a few) – sadly no pics of inside allowed but the whole of the ceilings are covered in the most wonderful mosaics. 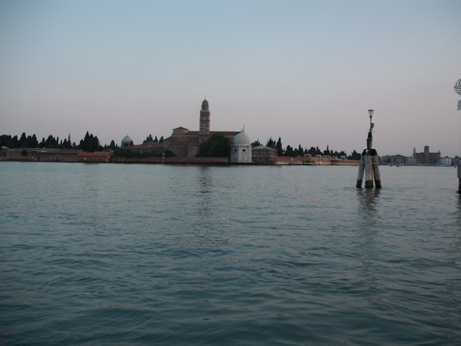 The slide show below shows a couple of the palaces along the grand canal, the Doge’s Palace and the Basilica in St Mark’s Square. 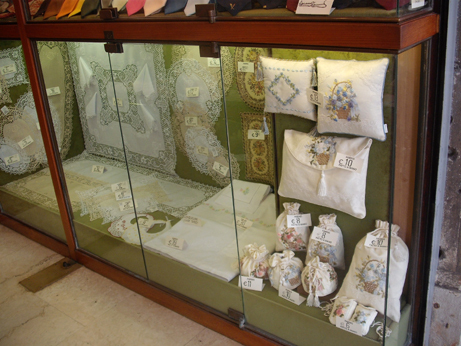 I also found a lovely lace shop in St Mark’s Square called Fabris – Venetian lace is made on one of the outer islands called Burano – one day I will go back for a visit and see that and also take more than a peek at this little museum/shop that the kids preferred going for ice cream to entering! 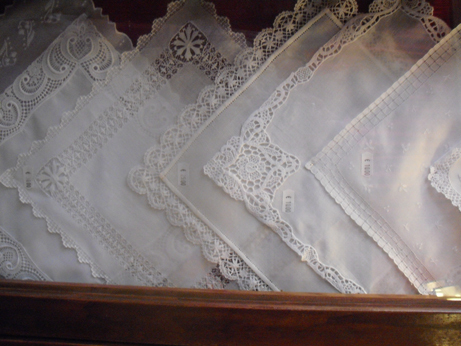 I did get a quick trip into the Fabris shop and bought some gifts – they had the most gorgeous table cloth and napkin sets – will go back and get some to go with my cake stand one day then we can have proper afternoon tea! 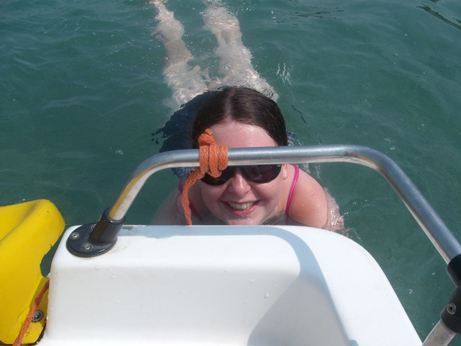 Will post further pics from the Lake Garda section of the trip soon – am just sitting watching the good old Yorkshire rain now – trying to remember how hot I was on Sunday! 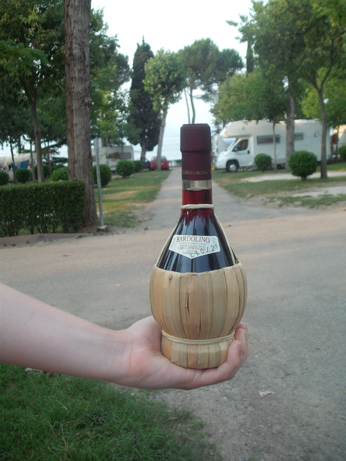 Thanks to my lovely hand model Ellie - a bottle of the local Bardolino red in authentic raffia with the view of Lake Garda behind it. 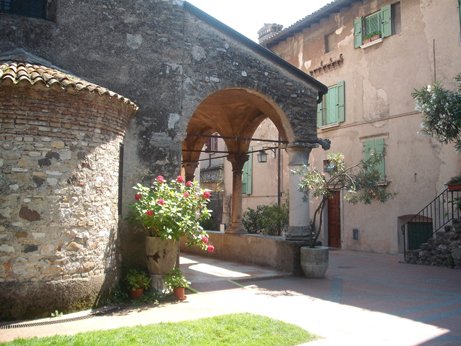 We have just returned from a very hot and very lovely week in Italy so I thought I would share some pics with you. 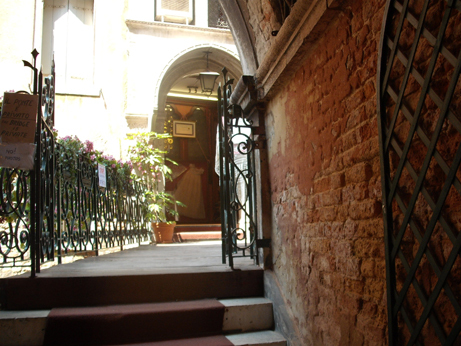 We flew to Venice so took the opportunity for another once in a lifetime experience and stayed overnight there in a 16th century palazzo on the Grand Canal (well it was my birthday while we were away!) 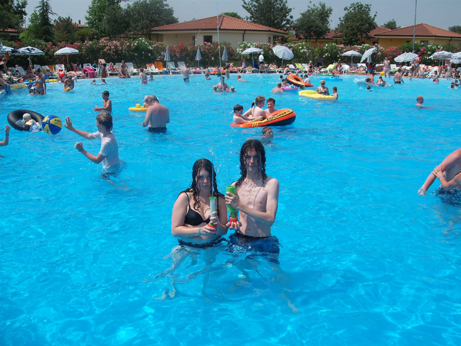 then on to our Lake Garda camp site where the above pic was taken. From the airport we took the waterbus so that we could get our first glimpse of Venice from the lagoon. Due to the fact that the waterbus was going the long way round into Venice and that it was getting late we decided to get off the other side from where we were staying so we had a little adventure getting all the suitcases over the little bridges and not getting lost down the little winding streets (thanks to Ellen’s excellent map reading skills!) and finally arrived at our hotel. A welcome sight late at night down the tiny little side streets! 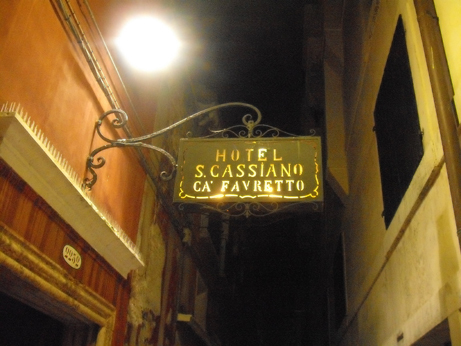 I found this as a late deal on the web through Expedia and it was very cheap considering it is a four star hotel and right on the Grand Canal. It was very, very lovely inside and made a very glamorous start to the holiday. Ours was the room right at the top at the front so we had amazing views and also sat on the other two terraces during our stay – the lower one being the bar where I met a very nice Canadian lady travelling on her own who reminded me a lot of Crazy Aunt Purl. She travels a great deal and gave me some useful tips about planning out trip to the US next year. The little slide show below shows you the glamour! We had a fab day in Venice – will post some pics of that later – it was amazing as you can expect and the kids were very tolerant of me and all the old buildings that we saw. 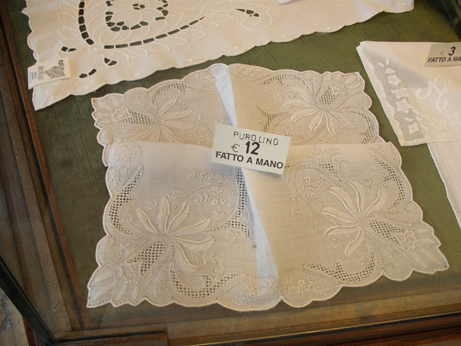 Also found some lovely textiles in a little Venetian lace shop on St Mark’s Square. Then it was off on a little adventure on an Italian train – very comfortable and efficient to our not quite so 4 star (more budget!) 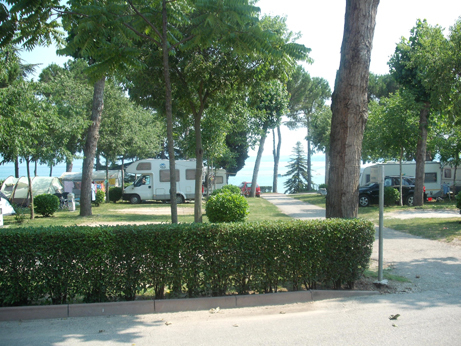 accommodation at the Bella Italia campsite right on the shore of Lake Garda. Mind you it was very glamorous considering the sort of camping we usually do in a field with portaloos. There was a little kitchen, electric lights and a plug socket and a water point right next to the tent (saving Jake a trek! 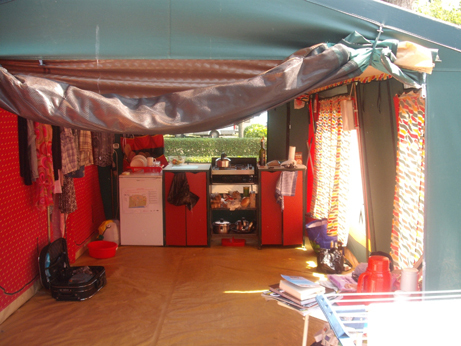 ), a gazebo, BBQ and loungers and a fab shower block . Luxury! And I think we got a better deal than the more expensive mobile homes and chalets as our pitches and the camping to rent pitches were right next to the lake so I had the most fantastic views. My camping luxury - a real cooker, fridge (ahh cold beer!) and cupboards! The view from our tent down to the lake and mountains - without the wine bottle! 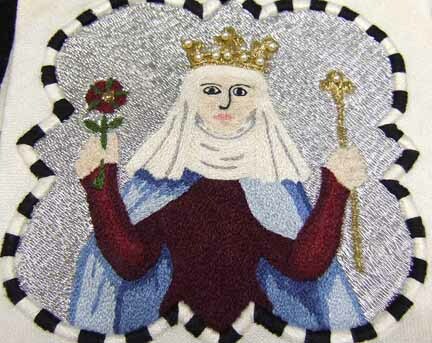 Will post more pics later – now off to Knitting group!